Brand new from the Conaito labs comes the latest revolution in browser applications, a Webcam and Audio recorder that lets your users record video and audio directly on your site to save and play back any way they wish! The benefits of this software are obvious, no longer do your users have to fork out on expensive software to record direct from their webcam, nor do they have to spend ages uploading their videos, it can all be done directly on your site. Conaito VideoMail uses Adobe Flash® to video and audio capture on client machine, on server side a installed streaming server is required (such as Red5, Wowza or FMS). The Conaito VideoMail SDK is compatible with all Adobe Flash® Player compatible Browsers. Video helps communicating message quickly and effectively, while holding viewers' interest. So webmasters are keen in presenting information in video format. 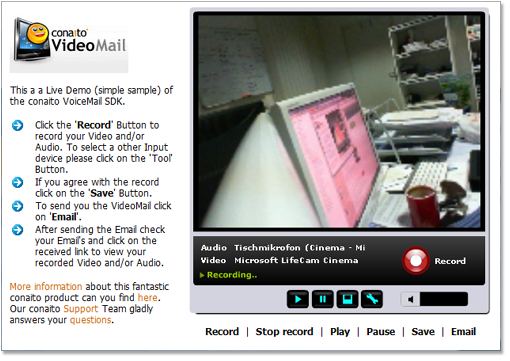 Recording and presenting videos on website is made easier by Conaito VideoMail SDK. Here we have listed some of the fields where Conaito VideoMail can be used, for reference. Admin can control the video quality, video Size, video capturing time and other video settings via admin interface. Theme setting feature lets the admin to develop a custom look and feel for the recorder. Admin can manage all the recorded videos, download them to the local system and delete the videos on requirements. Easy to install and maintain - easy as uploading and getting started! Supports Red5, FMS and Wowza server. Offers easy integration with PHP websites (ASP and ASP.NET samples coming soon). Can be completely customized to your taste, using the PHP/XML files. Easy to edit the upload location and maximum record length of the videos, through xml files. We hope you enjoy the Conaito VideoMail SDK – The Powerful solution for recording and sending video messages directly from your websites.